A day after I posted this article, Vessel announced they were closing permanently. Best of luck to them. I hope all that booze finds itself to Vessel 3.0. On my last two trips to Seattle, I had hoped Vessel would be open for my visit but the grand opening had been delayed. But when it finally opened, it still took me a while before I made it out to what is affectionately known as Vessel 2.0. I had not gone to the previous location but because of booze travel (that would be me traveling around the country in search of a good party), I along with other booze enthusiasts eagerly awaited for the bar to reopen in a new location. I had run into Kevin Langmack while visiting Sun Liquor Distillery who told me he was working at Vessel the next night. 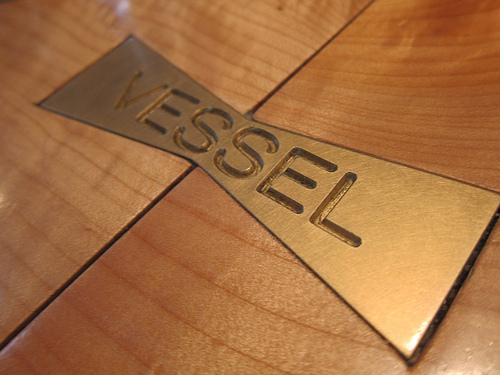 After dinner at Marination Station and a quickie drink at the Pine Box, we popped into Vessel. I had met Kevin when he was working at Knee High Stocking Company. He has quite the following in Seattle. 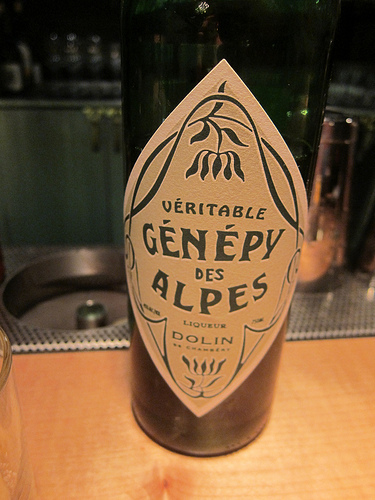 When I trust a bartender, I usually let them make me whatever they want but I spotted the Zwack on Up and knew I had to try it. 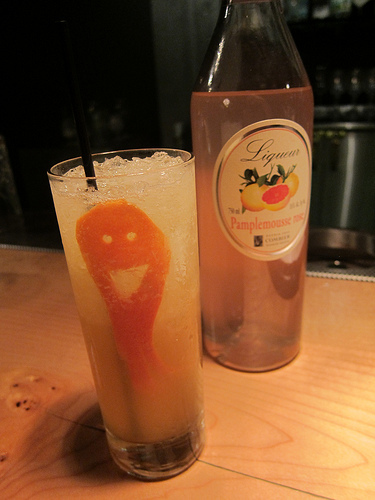 I’m currently in love with the Combier Pamplemousse Rose and really enjoy the pink grapefruit liqueur in cocktails. This drink came with the best garnish. As Kevin gave it to me, he said “say hello to my little friend.” Aw, so cute. If you look closely, you can see the legs of the octopus creature. Kevin likes to switch his cocktails list weekly but if you go on Sunday for brunch, you can catch both his menus for the week before and the current week. I had actually come into Vessel the day before in between lunch and dinner. The cocktail list very brief and I decided since it was still daytime, I’d go with a Ramos Gin Fizz. However, the bartender told me they were out of orange blossom water so she’ll make up something else. As I watched her struggle with the tin (after she put the coil in from the Hawthorn strainer) which exploded on her, she persevered with the shaking after wiping the tin down. It was obviously not foamy enough so she took an immersion blender to it. It was… interesting. 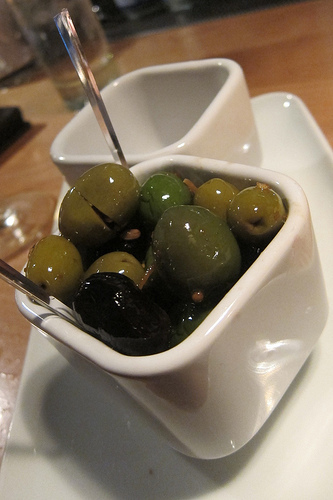 We were feeling snacky– I guess two tacos don’t really fill you up so we got the great olives in vermouth and the foie gras popcorn. I wish I was a little hungrier so I could have tried something heartier but snacks was all I could manage. 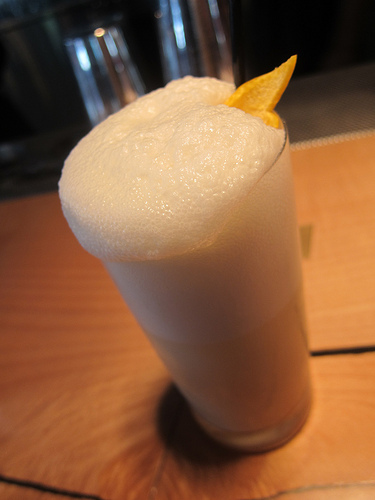 Good thing though because I spotted an ice cream float and inquired about it. 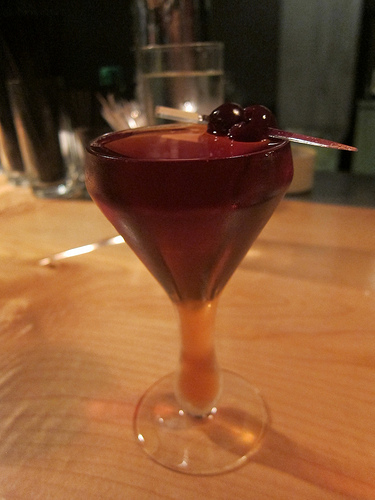 Kevin made me a drink with Art in the Age ROOT liqueur and Byrrh apertif wine. 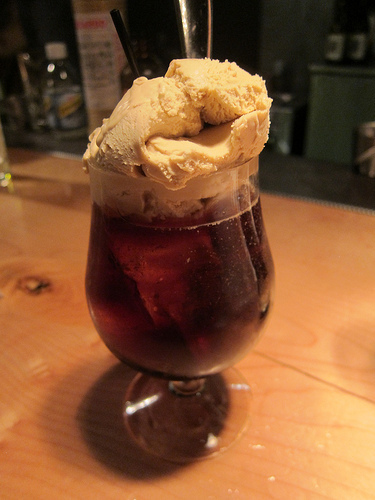 I do love my boozy ice cream. I was sad there weren’t globs of foie gras on the popcorn but I guess some may find liver and popcorn together disgusting. 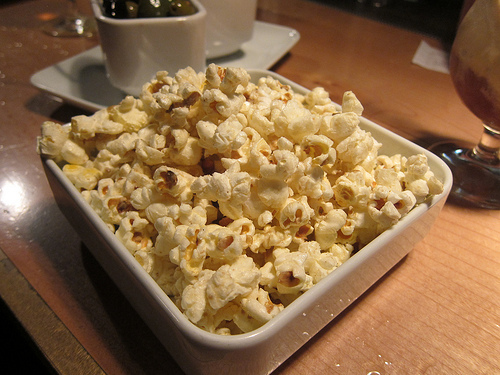 Ah well, maybe I can convince someone to do a foie gras torchon on top of popcorn. Wouldn’t that be some modernist cooking? 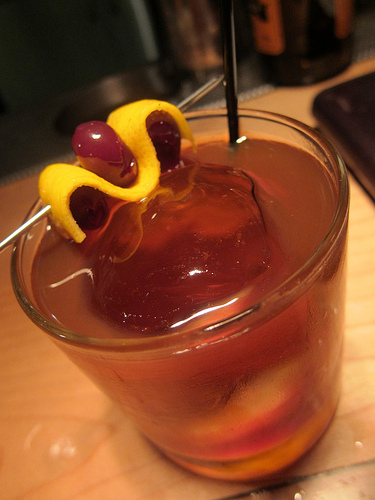 Next I had an Old Fashioned with Kevin’s housemade Red Cedar infused whiskey. 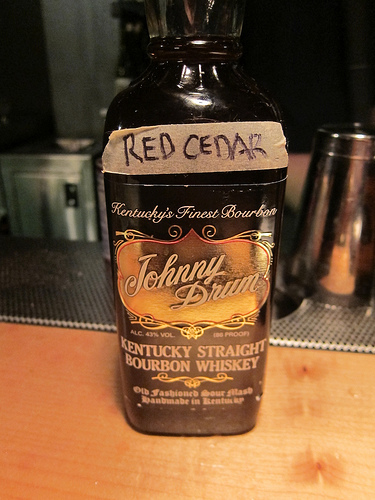 He gets the red cedar from Pike Place. It’s the same wood they usually cook salmon on. Kevin told me how he does his infusions which usually involves a sous vide process. This helps concentrates the flavor and generates it more quickly than just adding a couple of pieces of wood or fruit to his spirits. 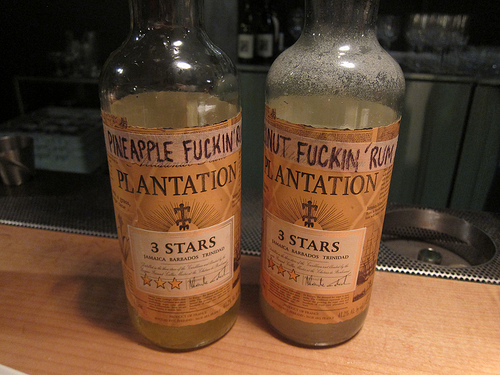 Here he gets creative the with the names of his Pineapple and Coconut infused rums. I love this vintage glass. This is one of the cocktails my friend had that I couldn’t resist taking a picture. 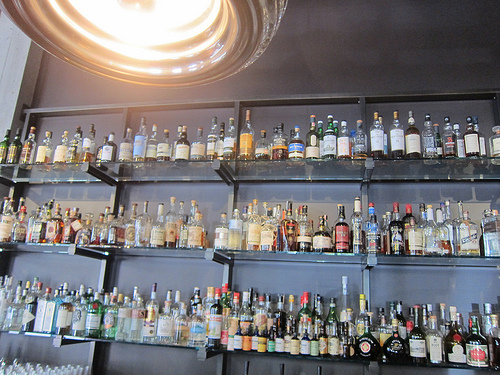 Vessel has a beautiful backbar and I can’t wait to visit again the next time I’m in Seattle. There’s so much to explore. Between them and Canon, it’s a booze nerd’s dream.